Basic Information: What is MD Nutri Hair? This is a review of a top hair product named MD Nutri Hair. MD Nutri Hair is suitable for all hair types and for both men and women. It contains natural ingredients which make it safe to use and effective. MD Nutri Hair will make your hair lustrous, strong and truly beautiful. Lilac extracts: It is the main component of MD Nutri Hair. It protects you from the harmful radicals in your body. Collagen: It helps to maintain the strength and flexibility of your hair. It keeps your hair hydrated. Lignan Powder: It is a plant-derived antioxidant. It is found in legumes, fruits, vegetables and whole grains. It supports the normal structure of your hair, making it more resilient. Niacin (Vitamin B3): It helps with the circulation, thus making your hair shinier and thicker than before. Flaxseed Powder: It is an anti-inflammatory agent. Biotin (also known as Vitamin H): It supports the health and vitality of the cells. Vitamin E: It is an antioxidant. MD Nutri Hair can be used either alone or in combination with other hair care products. 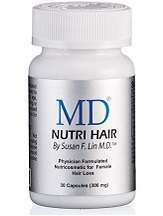 You need to take one capsule of MD Nutri Hair daily, preferably with the meal, to get the results. Each bottle of MD Nutri Hair contain 30 capsules which is a month’s supply. You can get one bottle of MD Nutri Hair for $50. No discounts and monthly or yearly subscriptions are available. I used MD Nutri Hair because my hair was shedding at a considerable rate. My hair was also very thin and had a life-less look. I did noticed a difference after using MD Nutri Hair but it took about a month. Although there were results, but they were not very significant. My hair fall has decreased compared to before but it is still there. I have been using it for about 6 weeks now. I could not get any instructions about the duration of using MD Nutri Hair for long term effects. I am going to use it another month to see if my problem resolves. MD Nutri Hair contains collagen derived from fish, therefore if you are allergic to it then do not use this product. Nursing mothers, pregnant women, people suffer from any medical disorder or the ones who are already on medication, should consult a physician before using MD Nutri Hair. The manufacturers of MD Nutri Hair do not provide any guarantee, which makes you question its effectiveness. However, the customer reviews about MD Nutri Hair are very positive and encourage you to give it a go. In a nutshell, MD Nutri Hair is a good product because it contains natural ingredients has positive customer reviews. On the other hand, it is very expensive, does not provide warranty and contains fish products in it, which makes it unsuitable for people who are allergic to fish.